Yee-Ping Cho Design is a multi-disciplinary studio creating a variety of thoughtful visual solutions for diverse clients large and small. Our expertise is storytelling and concept-driven design and business-centric, strategically sound ideas where art and commerce intersect and thrive. Located in Culver City, California, and available for project work, consultation, freelance and the occasional photographic venture. Our goal is to work with good people doing good work. So far, so good! "I have had the pleasure of working with Yee-Ping at Cross Associates, early in our careers, and again at Capital Group. 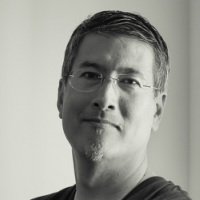 He is a gifted strategic thinker and multi-faceted designer who can quickly focus his considerable talents on any and all cross-channel deliverables, including print, webinar, conference, or presentation distribution. Yee-Ping sets the standard for professionalism with his calm, active listening skills, ability to articulate strategic goals and explain challenges while suggesting solutions. Great at working directly with clients, he is also a much admired team member. He not only understands the “big picture”, but also demonstrates his commitment to managing the details … I highly recommend Yee-Ping!" "I had the good fortune to work with Yee-Ping Cho throughout the course of more than seven years at the California NanoSystems Institute at UCLA. He is an enormously talented and creative designer who takes the time to listen and to understand the business goals and communication needs of an assignment before launching into the creative. He was able to process and address our feedback calmly and to respond with informed, workable solutions in a timely manner. He was a pleasure to work with and he consistently delivered exceptional design." Yee-Ping was the first graphic designer I ever worked with - and I've been spoiled ever since. Yee-Ping's design instincts are tremendous - he's got the capabilities to push boundaries, but versatile enough to stay conservative depending upon where the client needs to go. He's incredibly easy to work with - seriously, he's always got a great attitude. He always delivers on time - I've never known him to miss a deadline. And here's the true mark of what a great resource he is - over the years I've come to rely on Yee-Ping for referrals when he was unavailable... and every single one of them has been AMAZING. Which is to say that he's confident enough in his work to recommend other A-listers, and he's able to compete with them as well. Respectfully and in full disclosure, some of the clients and the work shown on this site reflect those relationships and collaborations. Yee-Ping Cho is ﻿an﻿ award winning designer with proven experience in creative direction, art direction and design in the areas of corporate communication and branding. He's comfortable wearing many hats and enjoys sharing his sandbox with others. A native of New York, he now lives in Los Angeles with his wife, Angelica, and his daughter, Nyla Pearl (and their fish, Fishy). Yee-Ping's work has been recognized and published in The One Show, Communication Arts, Print, AIGA, The Type Director’s Club, AR100, The NY Art Director’s Club, Graphis and Photo District News, among others. His work can be found in the permanent collection in the United States Library of Congress and his photos have appeared in the Wall Street Journal and The Graphic Eye, published by Chronicle.